Want to get radiant and younger looking skin? Have you spent tons of money on beauty products and yet not got the results you had dreamed of? Well, the secret to glowing skin lies in your skin. Have you heard of the adage, “What you eat shows on you”? This proverb is true because as our skin deals with stress, pollution, exertion and junk food that we eat, it loses its glow. So what can you do to regain this glow? Here is a list of superfoods that you should include in your diet plan for glowing skin. Apples contain a very vital antioxidant called quercetin that helps in protecting our skin against sun damage. Whole grains contain B vitamins that help cells in processing fats to rejuvenate and hydrate our skin. The complex carbohydrates mixed with fiber are digested and absorbed slowly and do not create sugar spikes that are responsible for acne. Remember to avoid processed and refined sugars as they contribute to acne. Dark chocolate is really helpful when it comes to planning your glowing skin diet plan as it contains flavanols that act as antioxidants, reduce roughness of skin, provide sun protection and makes our skin look healthier. Its roots contain vitamin A from carotenoids that prevents overproduction of skin cells and avoids clogging of pores and skin cancer. It is a vitamin C rich fruit that reduces the risk of skin cancer. This oil is really beneficial for our skin as it helps soften skin, fights bacteria and provides sun protection. Spinach contains folate, a B vitamin that assists in repairing DNA and lowering risk of skin cancer. It is also rich in vitamin K, vitamin A and iron. Vitamin K prevents varicose veins and Iron helps in circulation by carrying vital oxygen. Peppers contain more antioxidants and vitamin C as compared to oranges. And spicier peppers have capsaicin that promotes release of harmful toxins from the skin and improves circulation. When it comes to hydrating skin, watermelon plays a crucial role. It is also a great source of lycopene that eliminates skin-aging free radicals from ultraviolet exposure. They are packed with vitamin E and hence help in defending against sun damage. Also, almonds play a vital role in maintaining healthy weight. 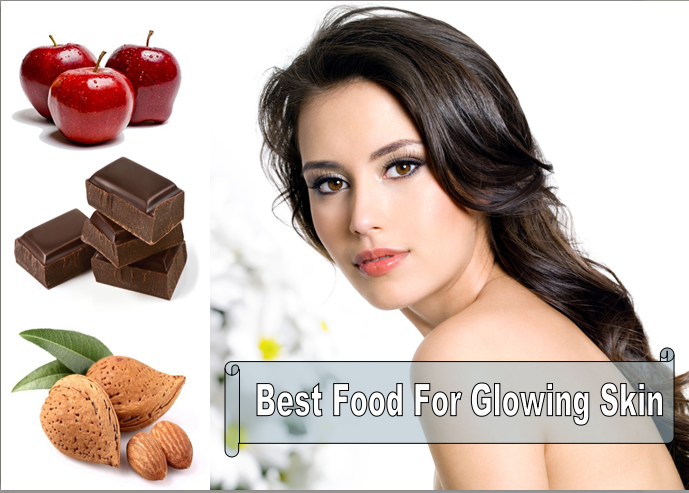 So if you want to have a glowing skin as well as reduce your weight then you must include them in your daily diet. They are packed with vitamin C and carotenoids that increase collagen production. Collagen controls flexibility, firmness and strength of skin. Tomatoes are also rich in lycopene and carotenoids that provide a healthy glow to our skin.